All of the Dublin Gay Theatre Festival venues are in the city centre within walking distance of each other and within easy reach of the main tourist attractions and city hotels and hostels. The city centre is divided by the River Liffey into two main areas – ‘Dublin 1’ north of the river (known to Dubliners as ‘the Northside’) and ‘Dublin 2’ south of the river (‘the Southside’). The main north-south axis is from Parnell Square and O’Connell Street (the city’s main street) on the ‘Northside’ to Trinity College, Temple Bar and Grafton Street (the main shopping street) on the ‘Southside’. All of our venues are close to these streets. Before your visit we recommend printing our online venue map to become familiar with our venue locations. Your first stop should be to the Dublin Visitors’ Centre on Suffolk Street (at the north end of Grafton Street). There you will be able to collect maps of Dublin and other information with staff on hand to answer any queries. You might also be interested in the ‘Dublin Pass’ and all-in-one ticket allowing entry to a range of popular tourist attractions and includes transport to and from Dublin Airport with ‘Aircoach’. There are a range of options to travel to and from Dublin Airport. While there is no direct rail link to the city centre there are frequent buses and taxis available for travel to/from the city centre (the ‘Aircoach’ and ‘Airlink’ being the fastest options). The journey takes approximately 30-40 minutes. Click here for details. For the city centre: tell the bus driver that you want to get out at Trinity College/College Green stop for the south city centre or O’Connell Street for the north city centre. The main train stations are Connolly Station (trains to/from the north) and Heuston Station (trains to/from the south and west). Rail information can be found here. The main bus station with connections across the country is ‘Busaras’ which is beside Connolly Station. The ‘Luas’ is a tramway with two lines (Red and Green). The Red line connects Heuston Station, Connolly Station and Busaras and is good for short hops from east to west in the city centre. It is also convenient to some Festival venues such as ‘Outhouse’, ‘Pantibar’ and ‘Teacher’s club’. The ‘DART’ is an urban railway which travels along Dublin Bay from north to south and is recommended for slightly longer journeys in and out of the city (Connolly Station is the closest stops to most of our venues, especially north of the river). ‘Dublin Bus’ provides transport across the city – most main city centre bus stops are around Trinity College and O’Connell Street. Taxis are reasonably easy to find in the city centre (although you may have to wait at peak times such as 3-3:30a.m. when night clubs close). Large taxi ranks include St. Stephen’s Green north and on Dame Street near Trinity College. If you have a smartphone you can use MyTaxi (formerly Hailo) to easily book a taxi on the go. The good news! All of our venues are within walking distance of each other in Dublin’s relatively compact city centre. However … please leave sufficient time to get from venue to venue, particularly if the area is not familiar. During the Festival you can always ask our box office and front of house crew for directions. Check out our venue map here. Since traffic can be heavy in Dublin City centre we suggest travelling on foot for short distances. Dubliners are generally quite friendly so don’t be afraid to ask for directions. Our front of house staff at venues are also available to help you if you have any questions. Do give yourself enough time to travel between venues if you are unfamiliar with the city or choose shows that are in the same, or nearby, venues. The time needed to walk from one venue to another varies between 5 and 20 minutes. Please note that streets in Dublin have a tendency to change names suddenly (!) so look for blue street signs at intersections. Also note that streets with similar names may not be beside each other. For example South Great George’s Street (the location of ‘The George’ gay bar) is south of the river while North Great George’s Street is a 15-20 minute walk away, north of the river. Note that travel on foot is quite safe in Dublin city centre, comparable to other European cities. However as with any city we recommend applying common sense regarding personal belongings and stick to busy well-lit busy streets at night time. If in doubt take a taxi. We will host a Festival Club every night after the evening’s shows. The nightly venues (all centrally located) will be announced in our newsletters or ask our front of house staff for details. Pantibar – one of our Festival venues, Pantibar on Capel Street is open seven evenings a week. It is the ideal place to have a drink before or after a show in the nearby Teacher’s Club or Outhouse. It hosts a range of events throughout the week. Street66 – another popular gay-friendly bar in Temple Bar, serving food during the day and drinks in the evenings. Open late at weekends. (Note: venue previously known as ‘The Front Lounge’). The George – a well-known Dublin gay bar and club and Festival Club venue. Particularly busy at weekends and famous for its Sunday evening drag bingo and show. Oscar’s Christchurch – Oscar’s is also home to some Festival Club nights and is situated in Temple Bar west close to Christchurch Cathedral. Bars are shown on our venue map. For more information on LGBT venues drop into Outhouse – Dublin’s LGBT community Centre (and Festival venue). Our Festival health partners are – STD Clinic at Harolds Cross Surgery – The clinic is run by one of Ireland’s most highly regarded experts in the field of sexual health, Dr. Shay Keating. The STD clinic offers a full STD screening including HIV results within 10 minutes. It also has the facilities for HIV Post-exposure Prophylaxis. This is a treatment to reduce the likelihood of HIV infection following sexual exposure, within 72 hours. The Clinic is open from 09:00 – 21:00 Monday to Friday. To book an appointment please contact the clinic Practice Manager on +353 87 234 5551. 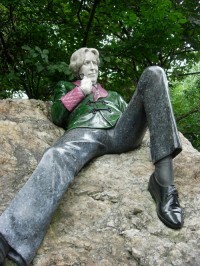 Merrion Square: visit the popular statue to Oscar Wilde in this city park, overlooking the house where he grew up. The Abbey Theatre: Ireland’s national theatre, the Abbey is famous for staging many of the great Irish plays of the 20th and 21st centuries. There are numerous other places to visit as well as tours and literary pub crawls! Check out dublin.ie and visitdublin.com for more.